American lawyer; born at Albany, N. Y., Dec. 13, 1856. He commenced the study of law there in the office of Rufus W. Peckham, associate justice of the United States Supreme Court, and ultimately became a partner, the firm consisting of Peckham, Rosendale, and Hessberg. Upon Peckham's appointment to the bench Hessberg continued in partnership with Rosendale, and since that time the firm name has been Rosendale & Hessberg. From 1883 to 1886 Hessberg served as assistant corporation counsel, and in 1887 wag engaged as commissioner to revise the laws and ordinances of his native city. In 1888 he was elected recorder of Albany, was reelected in 1892, and served till 1896. 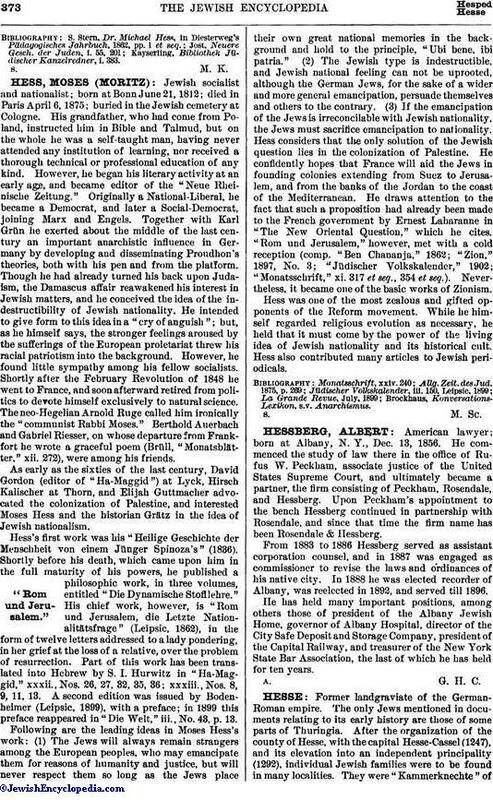 He has held many important positions, among others those of president of the Albany Jewish Home, governor of Albany Hospital, director of the City Safe Deposit and Storage Company, president of the Capital Railway, and treasurer of the New York State Bar Association, the last of which he has held for ten years.